Back in June, Our Worship the Most Excellent Jim Watson proclaimed August 10-18 Craft Beer Week here in the nation's capital. Two of those days were set aside for a celebration on the green lawns of City Hall, where a village of tents would house beer and food purveyors from near and afar. There would be music, and laughter, and many samples of the finest brews for those bearing the Wristband of Majority. Thus, come mid-August, we did take up our steins and raise a toast to the cloudless skies, the noble brew masters, the Mayor and all things beer. And it was good. Even better than the last time, actually. Seventeen breweries from across Ontario and western Quebec poured some 60 different beers over the Friday and Saturday, making for a lively weekend. Kichesippi Uncle Mark's Hopfen Weisse (Campbell Avenue, Ottawa) - Light orange flavour, mild hops and bitterness, not as sweet as other white beers, refreshing. HogsBack Sunofabeach ("virtual" brewery) - Filtered weisse with nutty, buttery caramel notes that one fellow described as 'Gerber bananas & pears'. Not sure about that, but this beer definitely came out on top as a favourite. I was quite intrigued by the enticing hints being dropped about the Oktoberfest celebrations they're sponsoring in Wunder-Barrhaven (September 28-30), as well as the mystery fall brews they're presently concocting. Mill Street Brew Pub Ottawa Frambozen (Lebreton Flats, Ottawa) - They already have a pretty stellar lineup of brews (many of which I have sampled) so this fruit-flavoured number is the icing on the cake. The raspberry is not syrupy nor is it sweet, but it's quite full-flavoured with a medium body. Muskoka Brewery Spring Oddity (Bracebridge) - Sweet tropical fruit with a tangy finish. Also tried a few sips Ottawa's Big Rig Brewery, which will require a follow-up visit to its west-end facilities; Cassel Brewery, all the way from Casselman; and Nickelbrook Brewery, based out of Burlington. And with such marvellous beer, there simply must be good food. Seed to Sausage had a couple pigs rolling lazily on spits, slices of chorizo to munch and a cheese-stuffed sausage-on-a-bun that had folks raving. StrataPizza borrowed some S2S goods to make a smokey sausage and red onion pie; we also shared a cup of Holé Molé (chili and dark-chocolate-dipped) and Tandoori-flavoured pecans done by It's A Belle Creations. 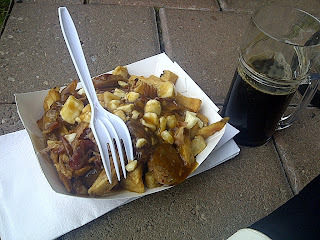 But oh, the poutine. This was an experience far beyond any inebriated 3 a.m. run to the nearest diner for the usual fries/curds/gravy. Spud's Poutinery and Potato Bar rolled out perfectly crisp, skin-on potato strings, Gatineau-style rubbery nubs of cheese, and Broadhead Dark Horse Stout gravy (which naturally required a sampling of the same to quaff with this dish.) As if that wasn't cause enough for total cardiac arrest, they topped it with sausage, strips of bacon and ... wait for it ... MAPLE SYRUP. Yup, that's right. Maple syrup.